Having tossed down a gauntlet on assignment creation, I could sit idly without bring some more “A Game”. Here ny example for a new assignment based on illustrating words that have no English translation. 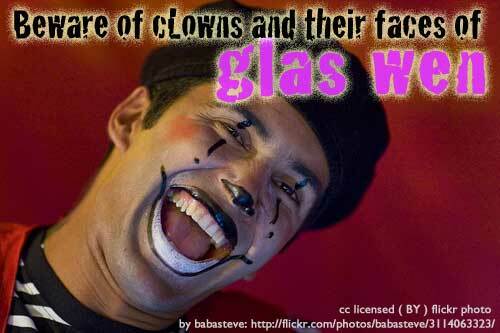 Clowns always mock us with their overly expressive smiles. They just want handouts. Background. During our drive to Montreal, I aimed to enterain my driver, Giulia, with reading descriptions of words that have no english equivalent… this all started with my trying to recall that French expression for the phenomenon where you come up with the perfect come back line much later than the situation where it would have counted (which turns out to be “Esprit d’escalier”. I will blog elsewhere the code for the site if anyone is interested or cannot figure out how to steal it. For mine, I did some searches in the flickr creative commons search for By Attribution on “smile clown”… I did not use compfight as usual so I could avoid the ones that are licensed as No Derivatives. I tried a few other seacrhes like “fake smile” “evil smile”, but decided that clowns would be handy since their smiles are usually fake painted. And I think clowns are scary. Use the Random Words with No English Translation tool (http://lab.cogdogblog.com/nowords/) to generate a word that could be better understood with a photo or image. Find a creative commons image or make your own, and include the word somehow in the image. Then share it with someone and ask if it makes sense. I have another assignment idea that will be a writing one that will use the same engine. The assignment machine is ON. This does look like ‘A’ game material Alan. I’m trying to find the assignment number and category for this assignment. Could you give a hint as to which category you filed your submission of the assignment?